One of this year's best software titles for young children. A visual delight filled with learning games. Appropriate for children ages 4 through 7, Miss Spider's Scavenger Hunt offers two modes of play: an immersive story mode with embedded games, and an activities mode where kids can just explore the games without playing through the story. In the story mode, kids join Miss Spider and her four children in the Cozy Hole. Miss Spider has created an individual scavenger hunt for each of her children: Squirt, Shimmer, Bounce and Dragon. 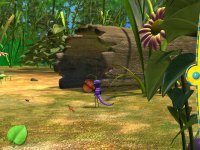 Kids accompany each little bug on its hunt through the forest. By clicking on the edge of the screen, kids select the direction the bugs should move. 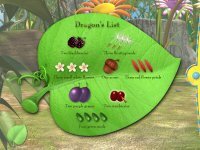 Since the woods is shown from the bugs' point of view, kids will be looking between blades of grass and under mushrooms to find specific items including berries, flower petals, and seeds. When kids spot a nature item on the bug's list, they click on it to pick it up. But the hunt isn't just about finding items; it is also about meeting, interacting, and helping other bug characters. Nine interactive games are introduced in the context of meeting other characters. In one game, just as kids are about to pick up a berry that is on Dragon's list, some ants nab it. The ants are willing to give up the berry if the player can guess which of the 15 ants in the colony is hiding it. Kids are allowed to ask a limited number of questions about the ant's attributes (color of body, shape of antennae, markings on body, etc.) to discover which ant has the berry. The game teaches children how to use the answers to their questions to logically eliminate ant suspects. In the activities mode, kids have the option of playing eight of the nine games introduced in the story mode. The games explore keyboarding, math, music, spelling, hand-eye coordination, and logic skills. They are appropriately themed to fit within the insect world, and thus kids complete sequences on a honeycomb frame, type keys based on what letter a butterfly is holding, and sort colored seeds. Both the activities and the story mode can be played on three levels of difficulty, so there is lots of replayability. While Scavenger Hunt is distributed by The Game Factory, it was created by Kutoka, a software company that has a history of producing award-winning children's software, including the Mia the Mouse and Didi & Ditto series. Kutoka is known for constructing breath-taking visuals and this software continues that tradition, with scenes full of sparkling water, lush vegetation, and bug characters that are whimsical instead of scary.